A blog about competition BBQ, smoking, grilling, cooking in general, including recipes for beginners, and just all around Foodie stuff. We will also review the occasional restaurant and perhaps a product or two. Check back during the year for competition pictures and results. As a matter of fact, I have a few dozen bones to pick with you. 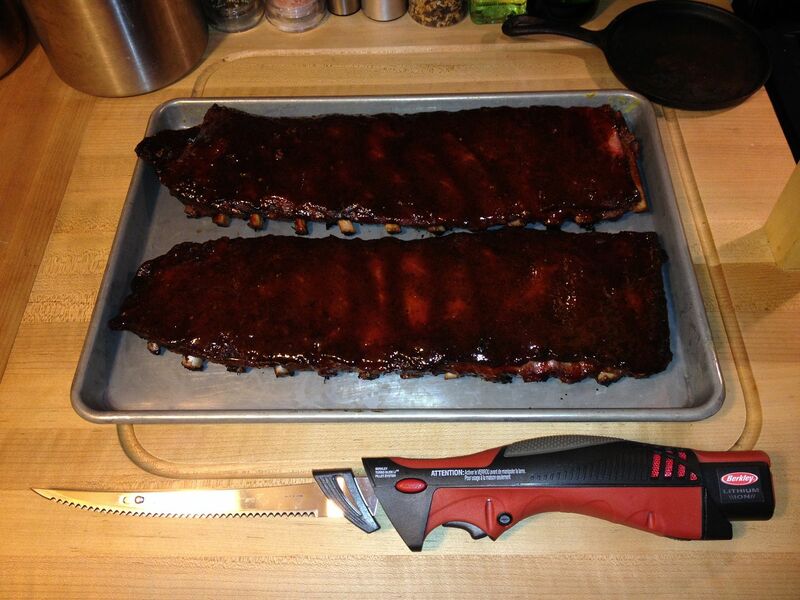 Time for some rib practice for the upcoming season. As you can see, we picked up some beautiful looking St. Louis spares from our butcher, Dave's Country Meats in Valencia, PA. We trimmed them up nicely and started with seasoning. 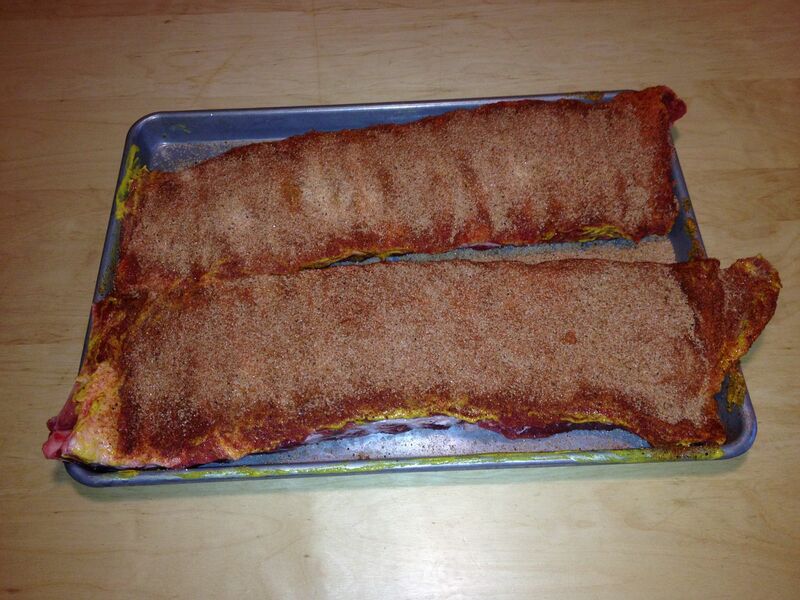 First, we slathered some yellow mustard on the front and back, then rubbed both sides with 1 cup of Oakridge Secret Weapon Chicken and Pork rub and 1/2 cup of turbinado sugar. 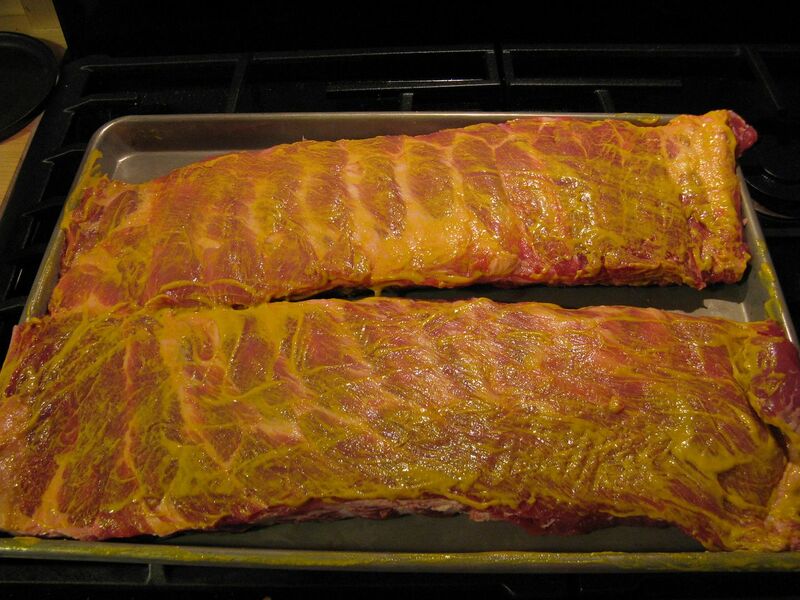 Then, we allowed the racks to sit and come up to room temperature while we brought the smoker up to 225 F.
After the first application of sauce sat for 30 minutes in the smoker, I added a second coat and let the ribs go for 30 more minutes. 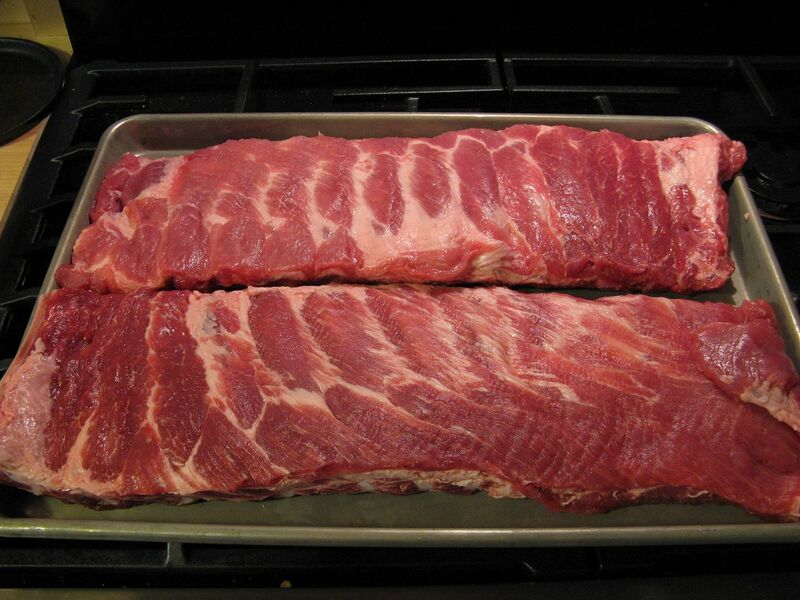 Then, I pulled them and let them rest for 15 minutes before slicing. Here they were after slicing. Nice, bite on the meat. The flavor was there, but I do need to add a bit more sweet. 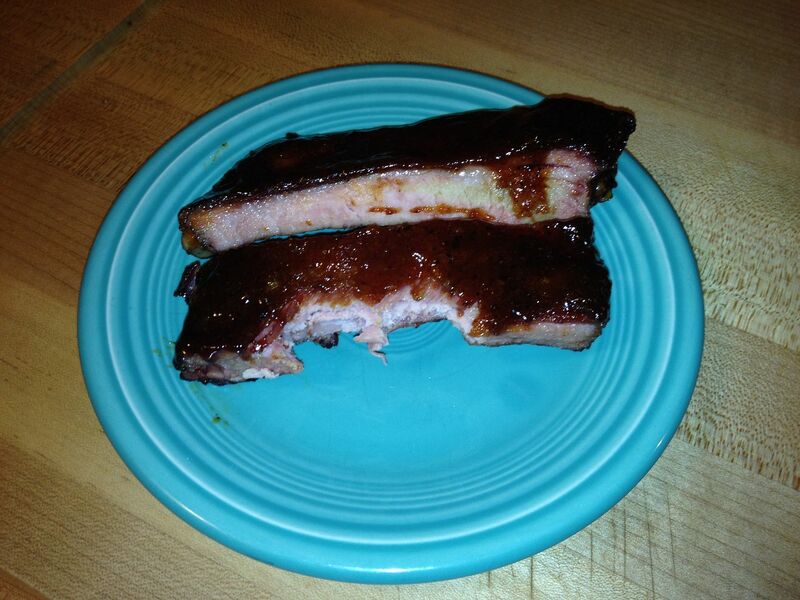 As for the tenderness, the ribs were good, but had just a bit too much tug. Next time, I am going to cook for seven hours and see how they turn out. Nice knife. May I suggest a higher cooking temp. 260-279, Two hours naked with spritzing every half hour. Wrapping the final hour. The sauce put on at the very end and only for enough time to set. My competition experience is limited to one cook but it was for a Grand Champion..
Glad you like the knife. I'll have to give the method above a try and report back. Thanks for the tip. Jeanie, it is a Berkley Turbo Glide Filet knife. It even comes with a handsome carrying case. 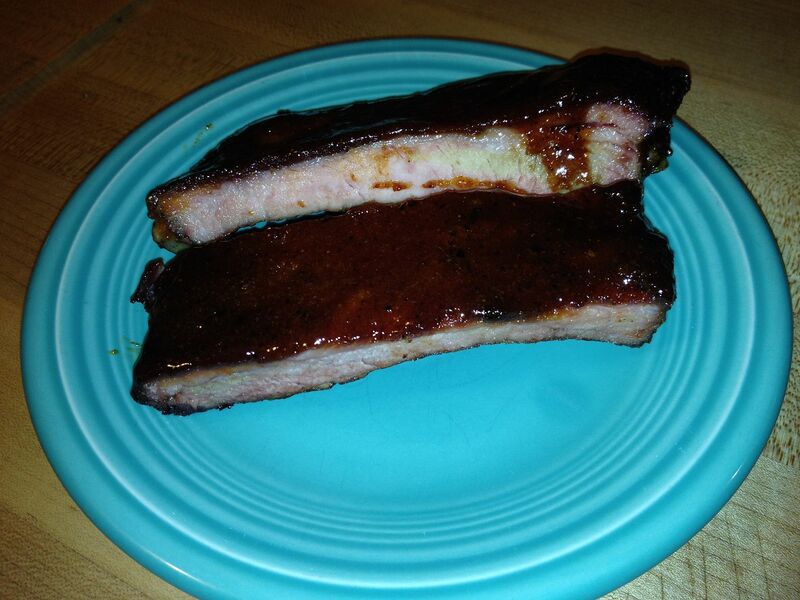 The Mad Meat Genius (Chilebrown) reviewed one and give it rave review. I would have to agree with his assessment. For an accomplished angler such as yourself, you might want to buy two. The contents of the Site, such as text, graphics, images and other material ("Material"), are protected by US and foreign copyright and trademark law. Unauthorized use of the Material may violate copyright, trademark, and other laws. You must retain all copyright and other proprietary notices contained in the original Material on any copy you make of the Material. You may not sell or modify the Material or reproduce, display, publicly perform, distribute, or otherwise use the Material in any way for any public or commercial purpose. The use of the Material on any other Web site or in a networked computer environment for any purpose is prohibited.